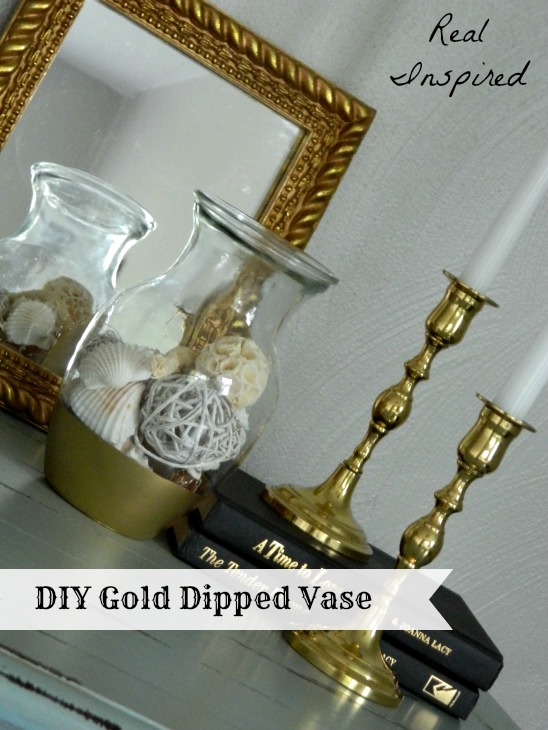 Yes, I really made a gold dipped vase. I've already mentioned that I'm not a gold person, but lately I find myself figuring out ways it can be used that don't look so bad. Okay, that look amazing. Like the little bit of gold on my new lamp. I'm not sure where this vase came from. It showed up on my kitchen table sporting pretty pink roses around Mother's Day a few weeks ago. But now I have it and vases are a nice thing to have around. I decided it should stand out from all my other glass vases though. 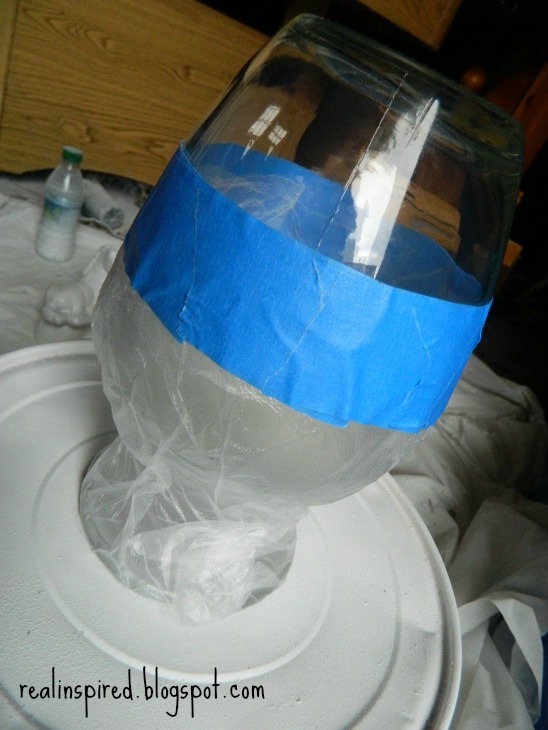 And so, the vase and I took a trip out to my laboratory the shed and got started. I used Press and Seal wrap to cover all the glass I did not want to become gold and then used painters tape to hold it all down and make a nice clean line where I painted. And now I am the owner of a gold dipped vase. I have come to realize that my original post was not super clear about what paint I used. I apologize for this. This post went up on a day that I was dealing with a fussy, teething, toddler. Anyway, I used Krylon metallic gold spray paint to get the dipped look. I was out of spray primer but if I had to do this again, I would have sprayed primer on it first as the paint wanted to peel off with the tape. I just had to peel it off slowly and smooth the paint back down as I went. Very interesting idea. What did you dip it into? Following you from DYI Showcase. Hi Janis, I'm sorry I wasn't clear about the paint in my post. I used Krylon Metallic gold spray paint to get the dipped look. I've updated the post with that information. Thanks for stopping by! Lovely and glamorous! Love it! And it's so easy, too! Totally easy! Thanks for dropping by! omg I LOVE it! I want to run home and do this now! thanks for sharing! You should! It makes me think of old Hollywood glamour...it's a great touch! Thanks! Thank you for coming by! Such a pretty vase. Thank you so much for linking up. So beautiful! 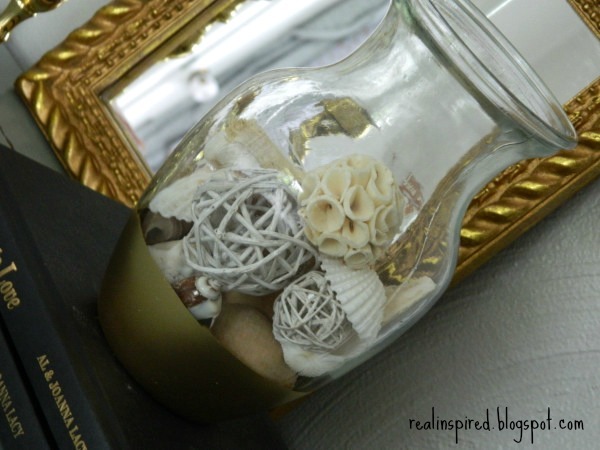 Great DIY ;) Thank you so much for sharing at Give Me The Goods Monday! Miriam of My Adventures with my 2 Kids favorited this post and you will be featured in our Top 10 on Saturday, June 22. Please watch out for it. Thank you for sharing and joining the Pin It Monday Hop. See you soon.